In the modern age, there are such a huge amount of options out there when it comes to keyboards and digital pianos. Working out how many keys you need, which features are best and of course which are the best beginner digital pianos and keyboards can be tough. In this article, we’ve collected 20 of the very best beginner keyboard options out there, including 44, 61, 76 and 88 key keyboards and digital pianos. We’ve also got some other variations, and a variety of features such as weighted keys and pedals. This list is designed to give plenty of choice to find the perfect model to suit your own needs. 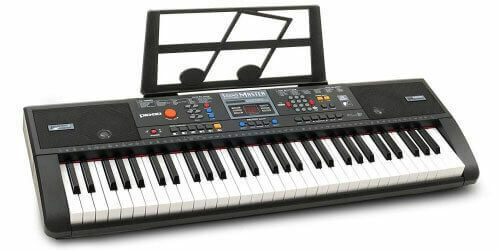 This is a wonderful electronic keyboard with 61 keys, which isn’t full sized, but offers plenty for beginners to get started and enables two handed play. ‘Joy’ may not have the amazing brand reputation as some of the other manufactures on this list, but they certainly have created a good product on a budget. This has many sounds to get you started including 255 timbres and rhythms to play along with. As well as lots of sounds and demonstration songs. You can also play along to MP3s, which can be loaded via a USB stick. One of the reasons this is one of the best keyboards for beginners is that it comes with everything you need. It is sold as a bundle with a stand, power supply and even a stool, so you don’t have to buy any extras. Just set it up and get started. The RockJam RJ761 is a model of keyboard we had to include as it is great for beginners. This comes with an inbuilt learning mode which can help you get to grips with the basics of playing keyboard and even helps to learn some songs. It pairs with its very own app in order to give feedback on your playing, so the RJ761 is definitely designed with starter level players in mind. This keyboard has 61 keys, which is fine for getting started. It also comes with all of the added extras you could need including a comfy piano stool, power supply and even a sustain pedal so you can play in a more professional way. Over 100 built-in sounds give plenty of variation. 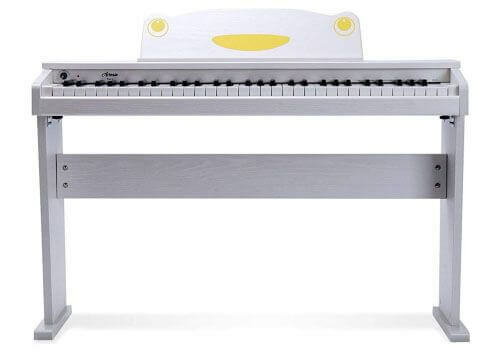 This keyboard has been designed perhaps with mainly children in mind, so it is a great choice if you want to encourage your kids to take up piano. It is almost inevitable that a number of models made by Casio make it to our list of top portable keyboards for beginners. The CTK-2550 can be purchased either as a bundle with headphones and a stand or on its own. This keyboard works with the Chordana Play app which can help further with playing techniques and learning how to play songs on the keyboard. A really fun ‘remix’ mode allows you to play around with dance music, chopping up sounds and experimenting as a producer and not just a keyboard player. An incredible 400 different tones are built in so you won’t get bored of the sounds in a hurry! This keyboard offers good value for money and is proof that Casio still make some awesome keyboards and digital pianos. Another Casio keyboard to make our list. The LK-190 has plenty to offer the beginner, and has features to rival the CTK-2550 (above) as well as the same number of keys. It also has a very distinct extra feature, the key lighting system. This is very popular among quite visual learners, it provides a way for you to see which note you should be playing next, or which notes make up a chord. You can get used to playing with guided lights before you try playing without help. This is another Casio keyboard with the dance music mode which gives you the chance to remix and play with sounds. This is a fun extra feature but isn’t necessarily what everyone is looking for from their keyboard. As a default, this isn’t sold with headphones or stand. You can buy it bundled with these items if you wish but it becomes a little on the expensive side, whereas for the same price some of the competing models include all of this as well as stools and music stands. The YPT-360 is one of the more ‘elite’ keyboards on the market. It is still 61 keys but offers some very impressive functionality and features. Not least of all, the touch sensitive design. This gives users a chance to get used to the way a piano or digital piano feels when playing as the key plays louder as you press harder. There are educational methods built in and even lessons to help to teach songs within the keyboard. It has 574 voices and even 150 arpeggio styles so you can experiment with new sounds. It works with USB and Midi so you can plug this into your laptop to transfer audio. There’s a lot to like about this keyboard, and it is definitely a model we’d recommend, but the main drawback is the price. It is more expensive than a lot of other 61 key models so we recommend purchasing it only if you’re serious about learning to play. As well as there being many high-end products on the market, there are some decent affordable piano options too. One of these is the Plixio 61-key electric keyboard. This is a lightweight and therefore very portable keyboard. You can take it out and about wherever you go as it has the option to be battery powered as well as through a mains adapter. There are only 40 tones, which is far from amazing, but it is enough for many who are just getting started. You can also plug in your MP3 player to play along to songs you love, and even add a mic fora karaoke style of playing. The cheap price means that not all of the features are as amazing and reliable. There is no learning mode and no touch sensitivity. As long as you don’t need these features, the Plixio is a consideration. There’s no surprise to see a Yamaha model on the list. The EZ-220 is another keyboard with lights to allow the user to learn in a visual way. It can be bought either bundled with accessories or on its own, depending on what you require. The bundle includes stand and headphones. There are 100 songs within the keyboard but also an app and ‘education suite’ to help learning. It also has 392 excellent different tones to allow you to play with different sounds. Like other light up models with such a lot of functionality for learners, it is not cheap, and this is the only real negative we could find with the EZ-220! The Hamzer 61-key keyboard is similar in many respects to a lot of the budget, 61-key options on the market. It is worth a look if you need relatively basic features and aren’t looking for too much in the way of learning assistant modes. It has mic and headphone support and even lets you record and play things back, which is a great extra feature, perfect for practicing performance. As well as working with standard power adapters, this is also compatible with batteries, and the Hamzer is lightweight enough to carry out and about. The Hamzer comes with 255 sounds and built in effects like sustain and vibrato which can be used. This is definitely one of the best value keyboards for learning! Yamaha’s PSR range of keyboards is known all over the world for the huge amount of quality it offers. They have models within this range to suit beginners of all sorts of ability levels, from inexpensive options to more high-end products like this, the EW300. As well as being almost full-sized with 76 keys, it has an incredible 574 voices and includes the Yamaha Education Suite to help you to learn how to play, and walks you through things at your own pace. 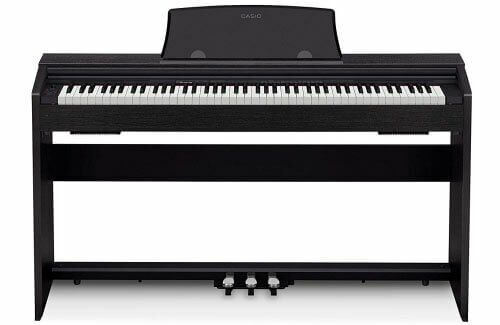 It has velocity sensitivity so plays more like a real piano and has the feel and dynamic of acoustic piano keys. The EW300 can even be hooked up to a laptop and music software with ease, so you can play your compositions and record them within a computer. Once again, as with many of the top level keyboards, the only real negative we found is the price. We should precursor this short review by saying the Casio SA-76 is recommended mainly for children! It is a wonderful option if you plan to get your kids engaging with music, but the keys are too small for most adults. Lots of the fun features here have clearly been aimed more at little people! The Casio SA-76 mini keyboard has 100 songs and 100 tones built in and can be used with percussion pads so is good fun for ‘finger drumming’. As it is so small and compact, you can easily take it out and about and keep your kid entertained on car journeys, for instance. This is affordable and easy-to-use for children, and is good for sparking that first tinge of interest in making music! Korg is a brand name associated with both digital pianos and synthesizers as well as a lot of areas of music technology. This digital piano has rightly made a name for itself as a brilliantly sampled and realistic feeling digital piano. As well as touch sensitive keys, you can actually alter the settings on the sensitivity to suit your own playing style and the level you are at. Ten different sounds are provided such as strings and harpsichord. These have been sampled from acoustic instruments and are much higher quality than the sounds on a keyboard would be, for instance. Midi outputs also allow you to control other instruments if you wish. This is relatively compact for a digital piano so can be taken to gigs, and though it isn’t cheap, the sound quality is exceptional. 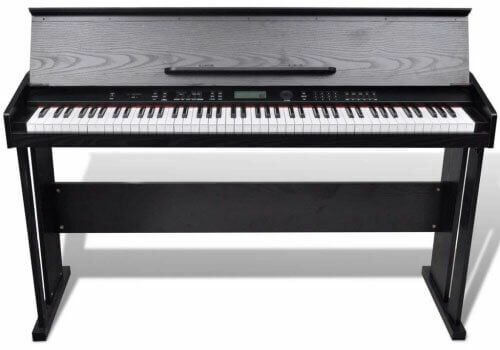 The Yamaha P-45 is another relatively compact digital piano, which isn’t sold with the stand so it is good for taking out and about to gigs. It is not well priced for a digital piano but still has plenty of good features. The piano sound is designed to be modeled on a concert grand, and is very realistic in terms of audio quality. This is combined with ten other sounds including organs and strings. The hammer action and velocity sensitivity can be adjusted, just like the Korg model above. You can set the P-45 to suit your own ability and style. This product comes with a sustain pedal to further open up your playing options, and can be purchased bundled with a stand if you wish. The only real negatives we could point out are the lack of sounds, the fact that the headphone jack is tough to reach and also the fact that the sustain pedal is not necessarily the best. 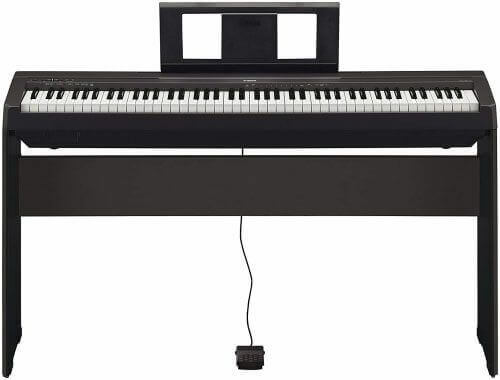 You can also check the Yamaha P71 (Amazon-Exclusive). There is no difference between these two pianos. The distinction is made so that you know the P71 is an Amazon Exclusive. The YDP-103 is more of a permanent fixture sort of product, and is not easy to move around or take out to gigs (though it is doable). It comes with a very durable stand which looks decorative as well as being high quality. Not only does it offer weighted keys, it even models the action of a real piano by getting heavier for low keys and lighter for higher. The sounds have ‘AWM stereo sampling’ giving a really rich and realistic sound. It even lets you combine two of the sounds, and play them together. In spite of these great features it also has easy controls and an iOS app to let you configure and customize. The only real negatives are the fact that it is not the most affordable, nor is it simple to transport. Casio is another manufacturer you will likely have heard of. Their range of keyboards and digital pianos is quite expansive. 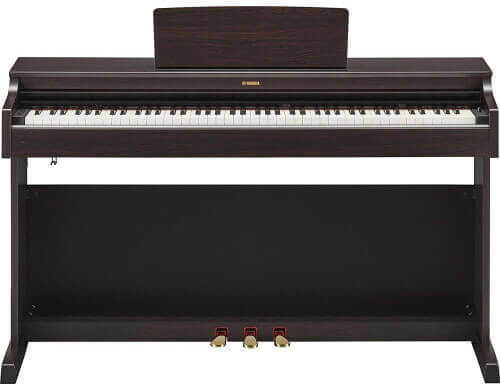 The Privia piano range is a relatively compact and modern way to get a realistic piano sound, as well as 18 other sounds built in. The resonant frequencies and ‘damper’ sound of the piano is designed to be realistic, and the keyboard can be split or layered to allow you to play multiple tones as required. The hammer action and touch response can also be modified to your own preference. It is textured in a way that is designed to feel just like ebony and ivory materials. Although the sound of this piano is not quite as perfect as some of the other models, it is a good option for beginners due to the fact that it comes with CD and book guides to help you learn your first tunes on piano. The Roland JUNO-DS88 is something of a middle ground between a synthesizer and an electric piano. 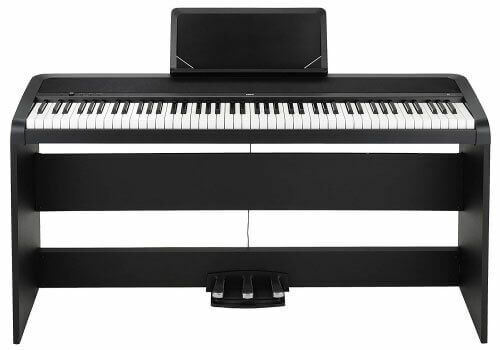 As well as having some excellent acoustic and electric piano sounds, this is designed to be exceptionally portable. It can be powered by either battery or mains power. All of the sounds from the JUNO-Di are included, which gives lots of options for recording and playing live. There are also expansion slots so that you can include new sounds if needed, which can be found on Roland’s website. The sounds can be altered with knobs and sliders on the piano itself, and there are also pads which can allow you to play out samples or even backing tracks which can be stored on a USB stick. This is a little on the pricey side, and the authentic piano sound isn’t the main priority, but if you are looking for an electronic keyboard for beginners with some new and exciting sounds, the JUNO-DS could be for you. Yamaha manufacture such a wide variety of musical instruments and their digital pianos have an exceptional sampling system so they recreate the sound of the CFIIIS grand piano with a great level of accuracy. The simple interface of the P-125 makes it great for beginners, and it is pretty small and easy to take out and about for band practices, for instance. It is a good option if you are starting lessons or looking for a simple but great sounding digital piano. As well as weighted keys and a 192 note polyphony to ensure even complex melodies can be played without dropping a note. This can be bought bundled so you have all you need to get started, – another reason it is wonderful for beginners. The weighted keys aren’t quite as realistic as some other models, but generally this not a problem if you want a piano keyboard for beginners. We understand that many of the beginners out there may be children. If you are looking for the best keyboard for beginners who are under 13 years of age then the Artesia FUN-1 is a good option. It isn’t full sized at 61 keys. It only has eight different sounds and there are other drawbacks if you are particularly worried about a detailed sound, such as just 32 notes of polyphony. However, for an affordable beginner keyboard this is worth considering. You can see that this is mainly for kids as it has fun extras such as animal sounds! The iPad compatibility means it is great for making your first steps into playing piano. We’ve included the Korg B1SP as it has some great features which make it stand out from other models. The brilliant sound system of 18 watts of power gives a rich sound. The 8 different sounds don’t give a huge level of choice, but they are well sampled and produce an authentic acoustic piano. A couple of excellent features which make this good for beginners who want to learn to play in authentic way include the three different pedals, which replicate those of an acoustic piano. It comes with the pedal board and a bench which means you have all you need to start playing. It even ships with a book to help beginners. Though the Korg B1SP could do with some more sounds, it is a good value for money option and complete system for starting to play. 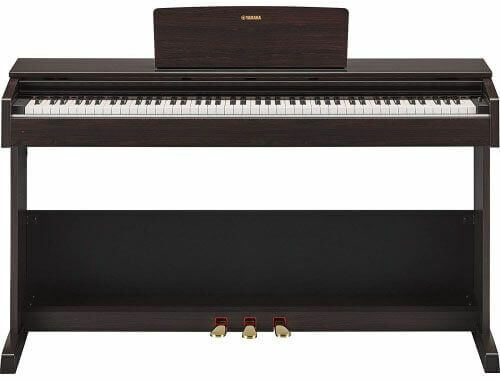 The vidaXL has been included mainly for the fact that it offers a budget, affordable option for a beginner piano. Not everyone has a huge budget, and this has a lot of sounds on a relatively small price tag. The tone is good quality though it doesn’t quite rival the Korg, Casio and Roland models. It has the full 88 keys which are touch sensitive, though aren’t quite as detailed as other options. What this does offer is an incredible 128 sounds to choose from and LED buttons to allow you to navigate through. Though it might be worth spending a little more on an option that can stay with you as an intermediate or pro player, this is good for getting you started. If you are a beginner who is serious about learning to play, a more expensive (but exceptional quality) piano to consider is the YDP-163. The excellent Pure CF sound is on offer, as with most high quality Yamaha pianos. It is wonderfully sampled from acoustic pianos which have a brilliant tonal quality. Three pedals give a lot of control over the sound and get you used to the tonal controls you will have as you become more confident as a pianist. The features which make this great for beginners include a lot of inbuilt songs for you to start to play, and it comes with a book to help you along the way. There is an easy recording function so you can listen and critique your own playing afterwards. The only real con to this product is the price, which is admittedly hefty, but if you have lofty ambitions of becoming a classy pianist then this could be the one for you. From our run down of keyboard and piano options for beginners, you will see how difficult the decision can be. There are good cheap keyboard options out there for under $100, and those which are well over $1000. You can find more options in our selection of digital piano reviews. We’ve tried to include the best of both worlds and give options no matter what features you prioritize. If you are looking for a simple option to decide whether playing is for you, or something to spark the interest of a child then it might be worth sticking to a keyboard. If you are very serious about your hobby and want to replicate the feel of a real piano then spending a little more on a digital piano could be worth doing.